LIST OF DEPARTMENT STORES BY COUNTRY - Wikipedia. LIST OF LARGEST SHOPPING MALLS IN THE WORLD - Wikipedia. LIST OF LEADING SHOPPING STREETS AND DISTRICTS BY CITY - Wikipedia. LIST OF WORLD'S MOST EXPENSIVE STREETS BY CITY - commercial & residential streets. 9 GIFT IDEAS FOR CATS & THE PEOPLE WHO LOVE THEM - Wired. 10 lies about Black Friday's consumerist circle of hell - The Guardian. 17 types of customer that seriously p*ss off anyone who works in a shop - Metro News. 2016 Holiday Gift Guide - The Verge. 2018 Christmas book at Neiman Marcus - "Lookbook of extravagant gifts." Alibaba's Singles Day record: $30bn in 24 hrs - "Alibaba smashed its single day sales record Sunday during the online retail blitz known as Singles Day." All under one roof: how malls & cities are becoming indistinguishable - The Guardian. Amazon’s future depends on moving from the internet to the physical world - "Amazon’s cashier-less Go stores give us a glimpse at its vision for the future of retail." Amazon.com - founded in 1994. World's largest online retailer. Amazon.com started as an online bookstore, but soon diversified, selling DVDs, CDs, video and MP3 downloads/streaming, software, video games, electronics, apparel, furniture, food, toys, and jewelry. The company also produces consumer electronics—notably the Amazon Kindle e-book reader and the Kindle Fire tablet computer—and is a major provider of cloud computing services. Best Gifts Between $50-$250 To Give This Holiday Season - TIME Magazine. Black Friday Deal or Dud? How to Shop Smart This Holiday Season - The New York Times. BLACK FRIDAY GUIDE - Best deals of Black Friday & Cyber Monday. Black Friday is a scam - 99% of all sneakers are cheaper on another day - "After analyzing more than 1.4 million prices of 4,024 sneakers from more than 200 retailers on RunRepeat over the past two years, it turns out just 1% of all sneakers are cheapest on Black Friday." CALVIN KLEIN - universal store locator. CONSUMER REPORTS (US) - "Expert - Independent - Nonprofit." Dubai unveils plans for $2 billion tech-driven mega mall - CNN travel. EBAY - founded in 1995. Online auction and shopping website in which people and businesses buy and sell a broad variety of goods and services worldwide. Enter the Shoe Aisle, Feel Your Phone Buzz With a Personal Deal - The New York Times. ETSY - "Buy, Sell, and Live Handmade." Your place to buy and sell all things handmade, vintage, and supplies. FLAGSHIP STORE - a company's main store that is used in showcasing the various brands the store offers. Unlike other stores within the chain, the flagship is usually more impressive, bigger and shelves more merchandise than the rest. floorwalker - an employee in a large shop (especially a department store) who acts as supervisor to sales staff, and assists customers. Fortnum & Mason toasts record sales - The Telegraph. GAP - sinde 1969. American worldwide clothing and accessories retailer. As of September 2008, the company has approximately 135,000 employees and operates 3,727 stores worldwide, of which 2,406 are located in the U.S.
Get Satisfaction - since 2007. Customer Community For Social Support, Social Marketing and Customer Feedback." GIFT IDEAS FOR DOGS & THE PEOPLE WHO LOVE THEM - Wired. Gimbel Brothers (Gimbels) - was an American department store corporation from 1887 until 1987. GROUPON - "Collective Buying Power." Deal-of-the-day website that is localized to major geographic markets in the United States and Canada. As of October 2010, Groupon serves more than 150 markets in North America and 100 markets in Europe, Asia and South America. Harrods begins £200m refurbishment - the biggest in the department store’s 170-year history - The Telegraph. Harrods founder escaped transportation after being convicted of receiving stolen currants - The Telegraph. Harry Gordon Selfridge - (1858-1947). United States-born British retail magnate who founded the London-based department store Selfridges. Henri Bendel and the Death of Luxury - The New York Times. How Not to Overpay on Black Friday? Let the web be your guide - The New York Times. How shoplifters justify theft at supermarket self-service checkouts - The Conversation. How The Smell Of Cinnamon Seduces Us Into Spending Money To Feel Better - Medical Daily. How to Pick the Fastest Line at the Supermarket - The New York Times. HOW TO RETURN & EXCHANGE YOUR UNWANTED HOLIDAY GIFTS - Wired. How to Save Money (and Hassles) on Your Black Friday Shopping - The New York Times. I tried to do my shopping with Amazon Dash buttons - The Guardian. Inside Amazon Go, a Store of the Future - The New York Times. JDPOWER.COM - making it easier to be a consumer. Just How Much Power Do Your Electronics Use When They Are ‘Off’? - The New York Times. KELKOO - "Find. Compare. Save." A European price comparison service founded in France in 1999. LUCKYMAG.COM - the online source for shopping & style from Lucky Magazine. 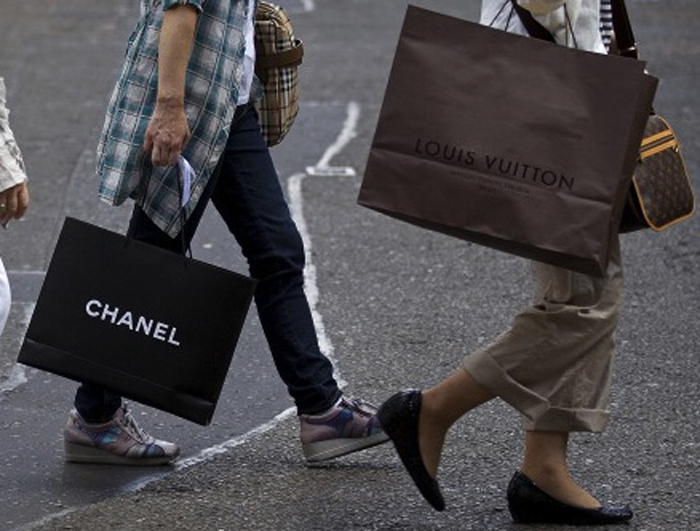 LVMH & the Next Big Digital Shopping Experience - The New York Times. MODCLOTH - American online retailer, based in Pittsburgh, PA, that specializes in vintage, vintage-inspired and indie clothing, accessories and decor. MYSTERY SHOPPING - tool used externally by market research companies. NEIMAN MARCUS - the christmas book 2010. NET-A-PORTER.COM - "World's premier online luxury fashion retailer." Designer clothes, shoes, bags and accessories for women. ODD PRICING - definition & explanation. PRICERUNNER - "Compare prices." A price comparison website, a free service that was launched in 1999. "We compare thousands of products and millions of prices, saving you time and money." Problem With a Company? Here’s How to Write to the CEO - The New York Times. Psychological pricing - definition & explanation. Purple Passport - web-based collection of chic, one-stop-shop guides to experiencing the world's cities in style. The site was born out of a passion for travel, a love of the world's great cities, and a desire to spread the word. Rebranding - marketing strategy in which a new name, term, symbol, design, or combination thereof is created for an established brand with the intention of developing a new, differentiated identity in the minds of consumers, investors, competitors, and other stakeholders. RALPH LAUREN - flag ship stores. real reason shops want you to sign up for e-receipts - The Guardian. SHOP USA - shop online in USA. "Your free USA receiving address. Buy from any seller. We ship worldwide." SHOPIFY - "Sell online. Create your online store today." Shopify provides you with an ecommerce website, an easy to use administration area, and secure hosting - everything you need to sell your products online. Shopping frenzy as Parisians say adieu to Colette, cutting-edge fashion store - The Guardian. Showrooming - definition & explanation. STYLE.COM - fashion trends and news. TEMPLES OF CONSUMPTION - "Shopping Malls As Secular Cathedrals." The big stores that track your every online move - engadget. The carrot trick - The Conversation. THE CONSUMERIST - "Shoppers bite back." The Incredible Shrinking Sears - The New York Times. THE LABEL FINDER - "The best way to find labels and shops." Label and store directories. Trying Out a Forgotten (and Free) Service: Personal Shoppers - The New York Times. What Do Consumers Want? Look at Their Selfies - The New York Times. Why you stick with decisions even when they make you unhappy - "The Sunk Cost Fallacy Is Ruining Your Decisions. Here's How." Wish - since 2011. Mobile & web e-commerce platform. Wish is the 6th largest e-commerce company in the world. Similar to eBay, small businesses and manufacturers on Wish sell goods directly to consumers. Woman who spent £16m in Harrods revealed - BBC News. world's 17 best Christmas markets - "Christmas shopping doesn't have to mean joylessly battling through department store crowds or trawling the Internet for bargains. Why not combine present-buying with some travel?" World's best shopping mall? - "Coal Drops Yard: Thomas Heatherwick transforms Victorian London landmark." You Gov Brand Index - since 2000. "What the world thinks." Best brands by country & categories.